A 114 page guide, smaller than A4 size, full colour throughout. 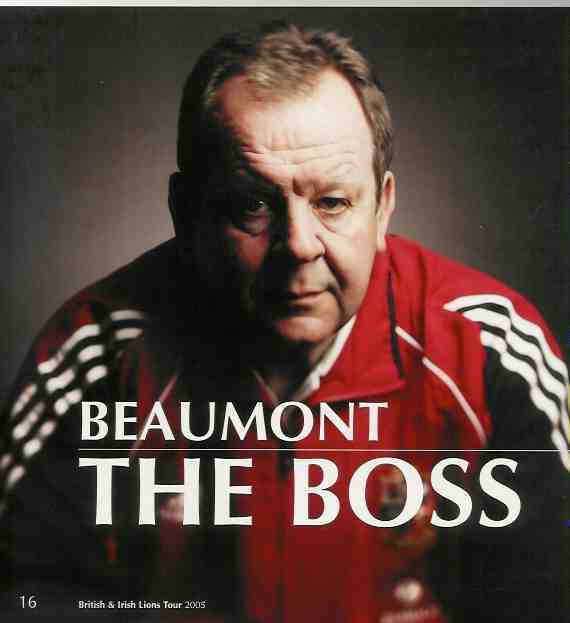 article - "Beaumont the Boss"
Article "The Forgotten Tours" by Brendan Gallagher of The Daily Telegraph, the story of the Lions in Argentina 1910, 1927 & 1936. 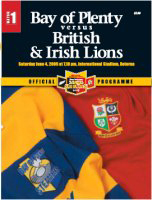 A fantastic easy reckoning Lions Who's Who giving you the full run down on Lions players from day one to 2001. Welcome messages from management & sponsors. 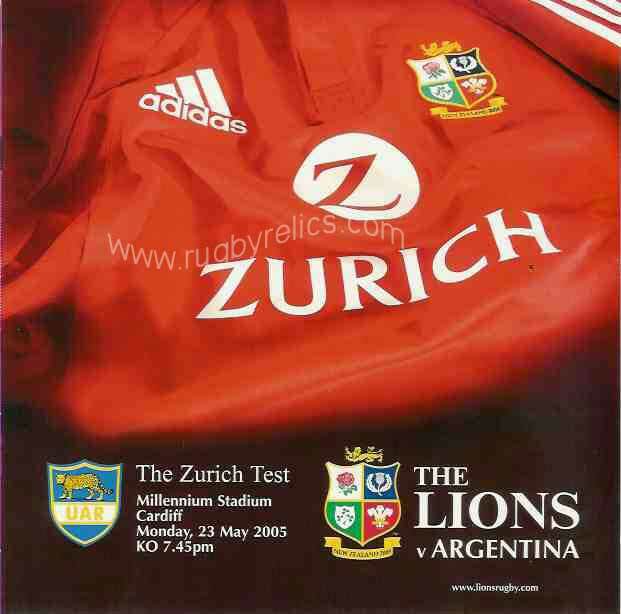 Welcome messages, Bay of Plenty player profiles & photos, Lions players profiles & photos, Comments by Duncan Johnstone & Stephen Jones, tales by Phil Gifford - stats by Geoff Miller, quiz time ! 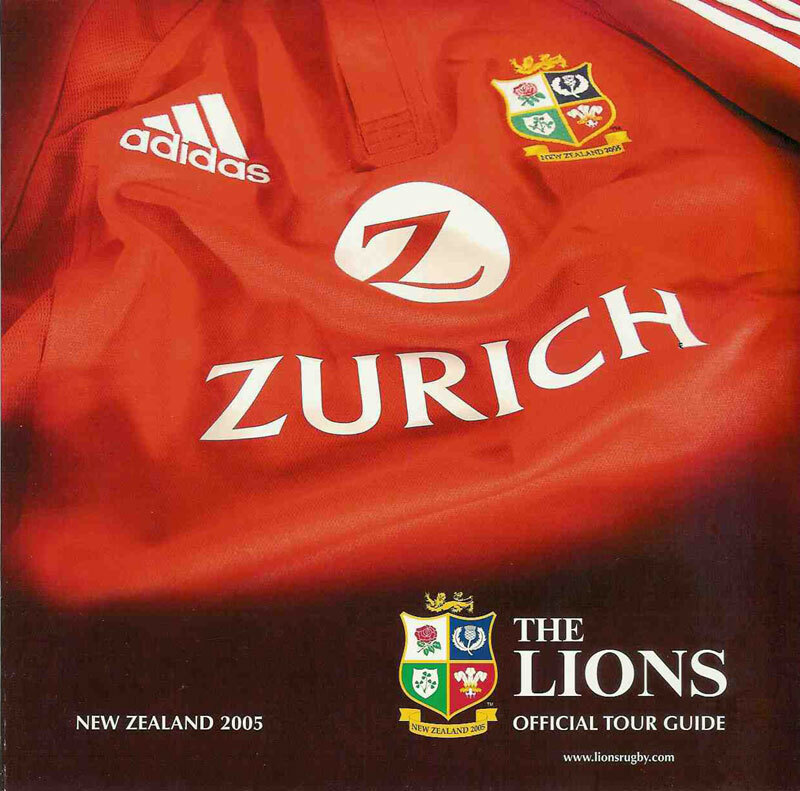 Back to Lions programmes page. 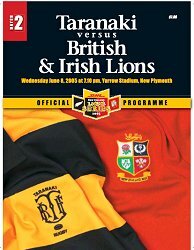 Welcome messages, tour update, Taranaki player profiles & photos, Lions players profiles & photos, Comments by Marc Hinton & Chris Hewett, tales by Phil Gifford - stats by Geoff Miller, quiz time ! 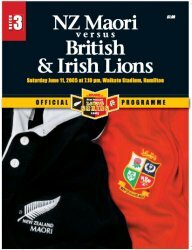 Kieran Crowley's (Taranaki coach) task ahead. 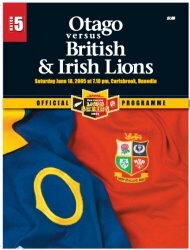 Profile of Gordon Slater the veteran Taranaki prop. 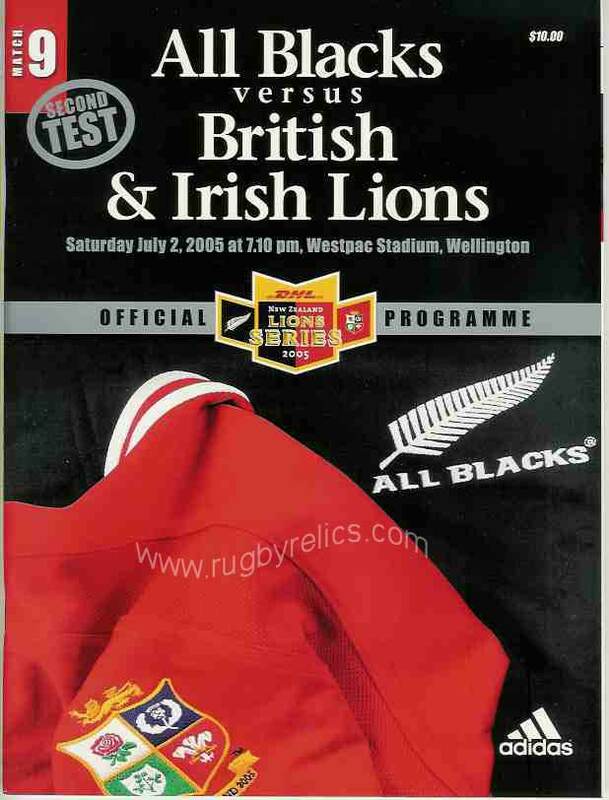 Welcome messages, tour update, NZ Maori player profiles & photos, Lions players profiles & photos, Comments by Robin Brooke & Paul Ackford, tales by Phil Gifford - stats by Geoff Miller, quiz time ! 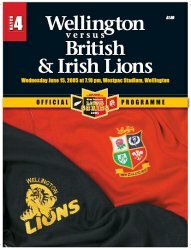 Welcome messages, tour update, Wellington player profiles & photos, Lions players profiles & photos, Comments by Chris Laidlaw & Peter Jackson, tales by Phil Gifford - stats by Geoff Miller, quiz time ! 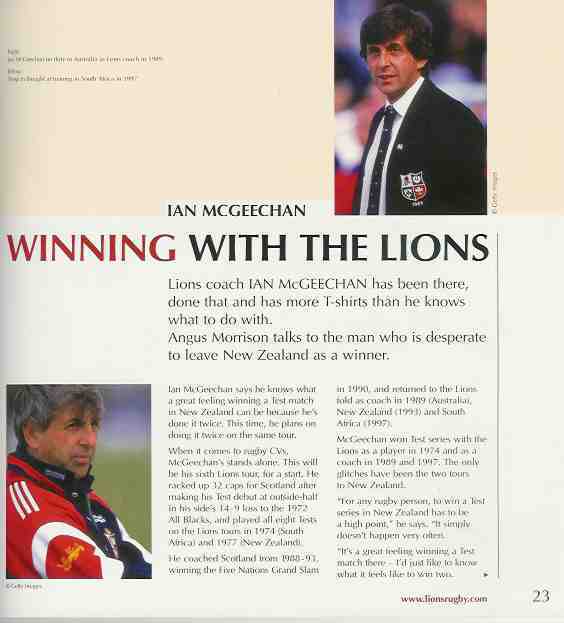 Welcome messages, tour update, Otago player profiles & photos, Lions players profiles & photos, Comments by Duncan Johnstone & Mick Cleary, tales by Phil Gifford - stats by Geoff Miller, quiz time ! 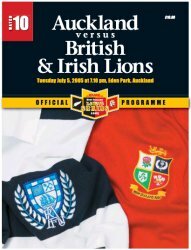 Welcome messages, tour update, Southland player profiles & photos, Lions players profiles & photos, Comments by Marc Hinton & Steve Bale, tales by Phil Gifford - stats by Geoff Miller, quiz time ! 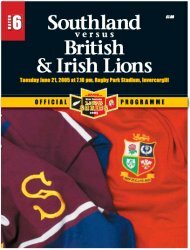 Welcome messages, tour update, All Black player profiles & photos, Lions players profiles & photos, Comments by Jim Kayes & Greg Growden, tales by Phil Gifford - stats by Geoff Miller, quiz time ! 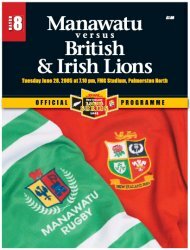 Welcome messages, tour update, Manawatu player profiles & photos, Lions players profiles & photos, Comments by Marc Hinton & Robert Kitson, tales by Phil Gifford - stats by Geoff Miller, quiz time ! 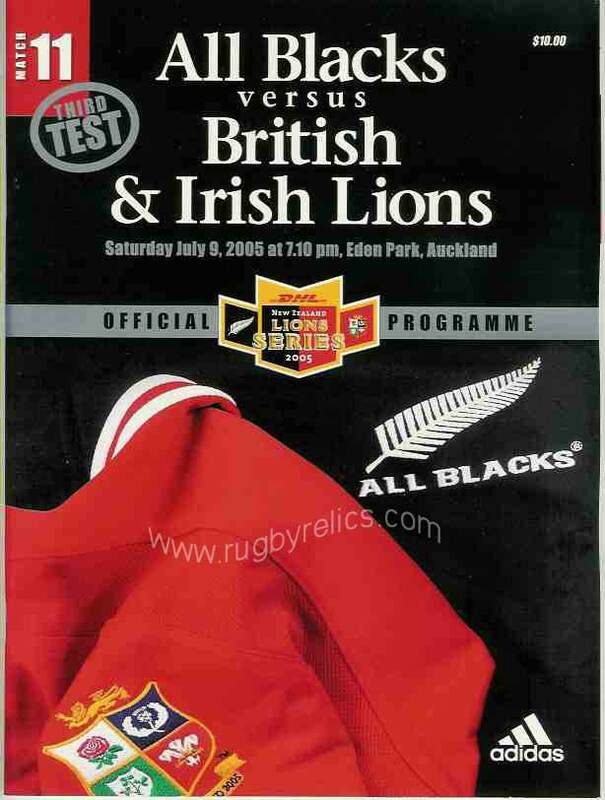 Welcome messages, tour update, All Black player profiles & photos, Lions players profiles & photos, Comments by Wynne Gray, Paul Ackford & Mark Keohane, tales by Phil Gifford - stats by Geoff Miller, quiz time ! 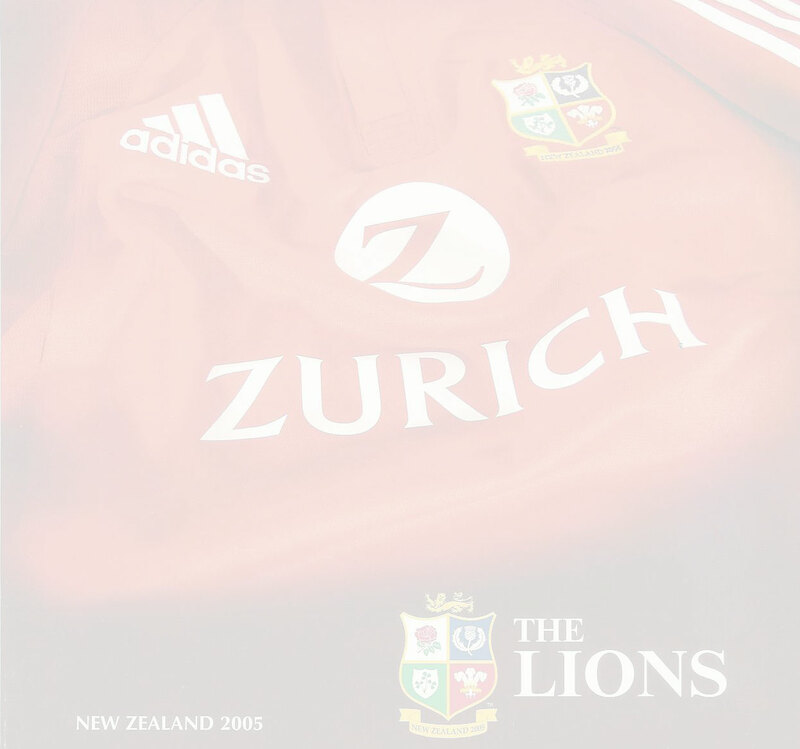 Welcome messages, tour update, Auckland player profiles & photos, Lions players profiles & photos, Comments by Duncan Johnstone & Chris Jones, tales by Phil Gifford - stats by Geoff Miller, quiz time ! 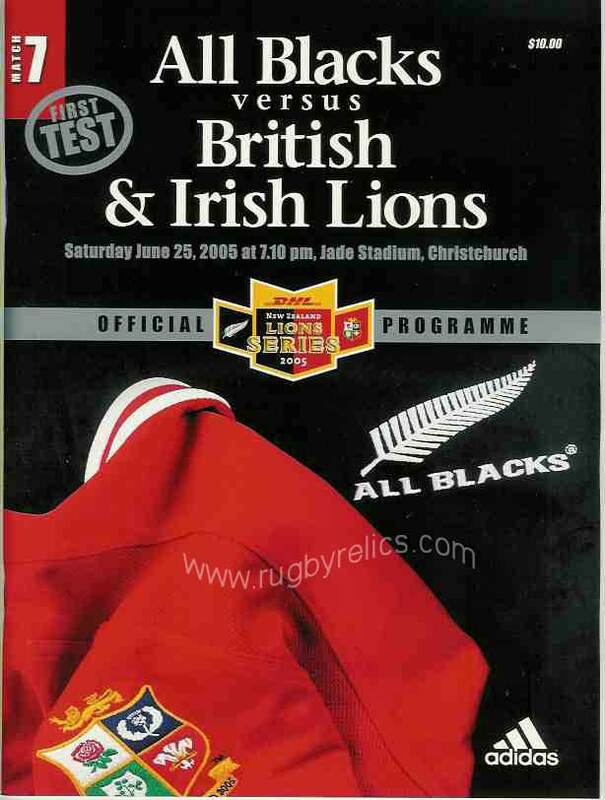 Welcome messages, tour update, All Black player profiles & photos, Lions players profiles & photos, Comments by Jim Kayes, Paul Ackford & Greg Growden, tales by Phil Gifford - stats by Geoff Miller, quiz time !